Windows uses DLL files, also known as a dynamic link libraries to store common scripts and programs that are used by multiple applications. DLL files cannot be run by themselves, and cannot be launched directly. Therefore an application called rundll32.exe is used to access DLL files and the information they contain. It's normal to see multiple rundll32.exe instances running, and this file forms part of the Windows system. Its usual location is within the system32 folder in Windows. If you see rundll32.exe stored anywhere else you should consider the possibility that it is a malicious file, as some malware and spyware create executable files called rundll32.exe in order to disguise their true nature. 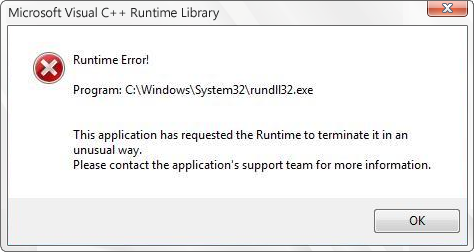 It's not very common to have an issue with a legitimate rundll32.exe file. Most reported problems with this file relate to virus damage - malware files pretending to be rundll32.exe. These usually manifest themselves by creating processes that consume large amounts of system memory and resources. If your rundll32.exe becomes corrupt, damaged or missing, your computer will quickly complain as it's a file that is used consistently for accessing DLL files. You can repair this damage by one of the following methods. Restore rundll32.exe from the recycle bin if you accidently deleted it. Restore rundll32.exe from your virus software's quarantine vault if it has been incorrectly diagnosed as a virus. If you're suspicious that rundll32.exe isn't operating correctly, you can check to see exactly what it's doing from the Task Manager. Run the task manager and click on the "processes" tab and sort by image name. Under normal operation you should see one or more instance of rundll32.exe running. Usually rundll32.exe will use little or no CPU resources, so if you see it's using a large amount of CPU power, in the range of 50% or above, this could be an indication of a problem. For a more detailed analysis of what a rundll32.exe instance is doing, you will need to modify the view of Task Manager to include the command line column. This will show you the individual DLL file rundll32.exe is accessing. As not all DLL files are immediately recognizable by their filenames, you can then go to the system32 folder and locate the DLL file referenced. By holding your mouse over the filename it will give you a file description and which company developed the file. By doing this you can usually figure out what the DLL is responsible for. Don't forget that you could have multiple rundll32.exe instances running at one time, so you may need to check them all. It's very common for malware to use files called rundll32.exe to execute their own programs. This is because rundll32.exe is a common Windows executable and is used by malware as a camouflage. If a file called rundll32.exe is using large amounts of memory or is located outside your windows/system32 folder, you should run a system scan and an anti-malware program.